I’ve been working with the Raspberry Pi 2 and wanted to install NOOBS on my SD Card to play with Linux. Unforunately, the SD Card that I had would not format to FAT32. 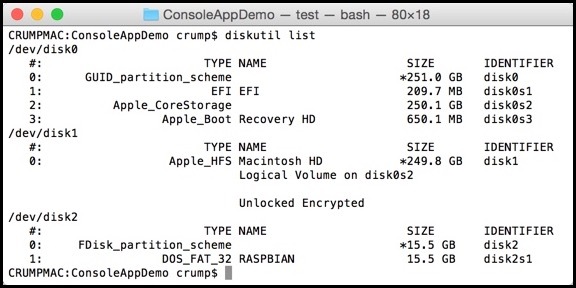 I tried using Disk Utility as well as the offical SDCard application for OSX. Both applications would format the card, but I could not click on it in finder and be able to paste files on it. I found an easy fix that I thought I’d share. You can tell it worked, by running the diskutil list command again and it should show the SDCard as a DOS_FAT_32 type instead of Windows_FAT_32 shown earlier. Thanks for reading and I hope this helped you save some time!